Finnegan #5150 - Yankee Golden Retriever Rescue, Inc.
Finnegan was 2 ½ years old when his family had to find him a new home. Finn lived with an autistic toddler who had been frightened by a neighbor’s dogs. Despite the family’s best efforts, it became clear that the child was now too scared of dogs to live with one, even though Finnegan had been part of the family since puppyhood. They had no choice but to find Finnegan a new home. Finnegan was brought directly to one of our animal hospitals where he was treated for a mild ear infection. The vet staff also discovered that this clever boy could open gates! Finnegan came back to Riverview where we made sure that we clipped all the gates so he would not get any ideas. Luckily, our fences here are 5 feet high because Finn’s original family also said he could jump fences that were lower. 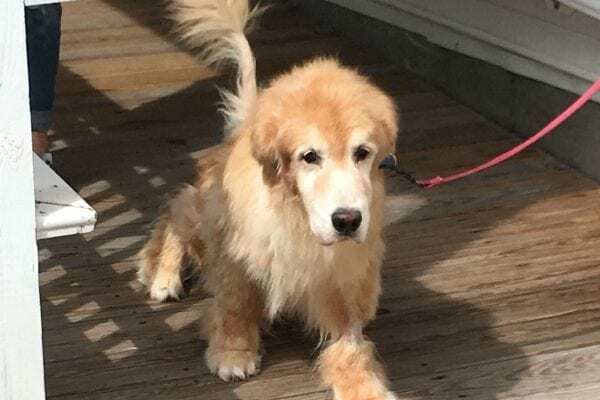 Finnegan loved to get attention and was a very affectionate Golden. He was a typical active young boy and would get very excited to go for a walk or to play with toys. He still had some puppyish behaviors, such as chewing things he shouldn’t or jumping up on people. He did know some basic obedience and would sit, lie down, and give his paw. He was a wonderful boy and he was a lot of fun to spend time with. He needed a home that would continue working on his manners and give him the attention and exercise he needed. Finnegan is now in the perfect home. A wonderful family of repeat adopters was ready to welcome another lucky Golden into their lives. Finnegan’s new family is showing him the ropes and says he is a fast learner. They admit, though, that although they try to be firm, Finn has them wrapped around his little paws! Finn is already very attached to his new owners and he sticks to them like glue. His family says he is a sweet and wonderful boy. They feel very blessed and thankful that they were able to welcome Finnegan in their lives! Finnegan thanks you for your continued support during this busy holiday season and all year round. It is you who make these happy endings possible for dogs like Finn. We take the time to get to know each dog that comes to Riverview so we can find him or her the perfect adoptive home. We are fortunate to have our own adoption facility where our professional staff and trained volunteers treat each Golden like our own during their stay. We are able to commit to this high level of care only because of your generosity. 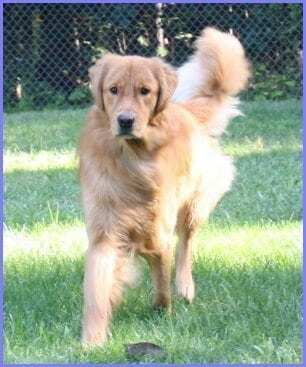 Finnegan and all the Rescue Goldens thank you and send big wags and kisses your way!